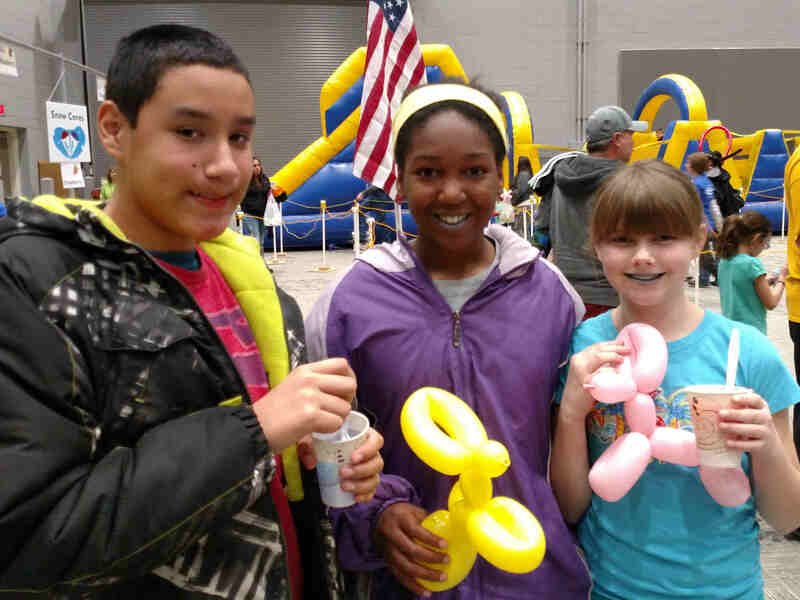 On a recent Saturday in Sioux City, Iowa, not even snow could keep more than 2,000 children and their families from enjoying inflatable rides, music, karate demonstrations, snow cones, popcorn, puppets and much more at the Sioux City Convention Center. Child Evangelism Fellowship® (CEF®), the world’s largest children’s ministry, hosted its annual Good News Spectacular for the fifth year in a row from 1 – 3 p.m., drawing folks from Woodbury, Plymouth, Ida, Lyon Sioux, Monona and Sac Counties. The purpose of this free event is to share the love of Jesus Christ and His saving grace with area children and their families. One way CEF explains the Gospel is through The Wordless Book. The colors and shapes tell the story, without using any words, of Christ dying on the cross to take away our sins so we can be cleansed from all unrighteousness and reunited with God for eternity. To access the largest ride at the Good News Spectacular, children and their families proceeded through the “Wordless Book Room” where they received a clear presentation of the Gospel. Not only did 130 children give their lives to Christ that day, but so did four parents! In addition to nearly 250 CEF volunteers, Woodbury County Police sent approximately eight reserved deputies to help with the event and even promoted it on their Facebook page. “I think it’s just great for people to see the church, the body of Christ, coming together and serving their community,” said Bob Fowler, director of CEF of North Carolina. Find out how you can take part in CEF Siouxland Good News Club Spectacular event.